Posted September 21st, 2011 by Karl & filed under Technology. 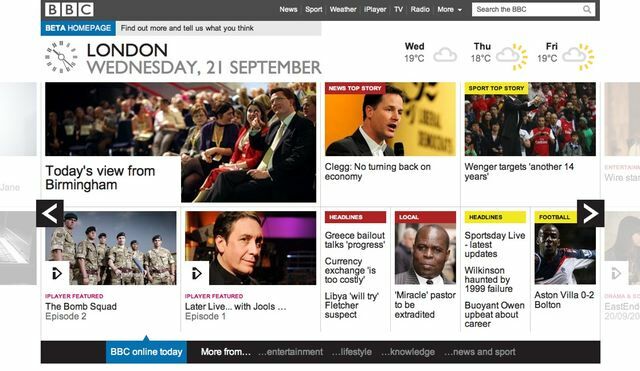 A few of hours ago the BBC announced the unveiling of their new look BBC website in beta form. The new page represents a dynamic paradigm shift for it’s users and how they interact with the site, providing what the BBC hopes to be a more varied focus on news articles on the home page. In recent years the BBC has reported on a gradual decline in visits to their website as their homepage has plateaued, citing a lack of distinctiveness and narrow focus on the homepage. The BBC hope that the new style and look of the beta page will help to combat this growing decline. An article back in 2008 by the Guardian commented on how the BBC Trust felt that the website bbc.co.uk was “failing in it’s role as a ‘trusted guide’ to the internet”. The recent move then is likely to be an attempt by the BBC to help rectify this problem, by allowing their visitors greater control and choice over the articles they can view. Even if this particular shift could be considered a little delayed. “Visual-first design with carousel” – This essentially is the colour coding of categories. The idea of which is to allow easier identification of the different categories present. “Simple Filters” – The replacement to the old “customise this page”. As mentioned, will be more in line with the mobile phone version. Sliding ‘drawers’ to reveal more or less detail across showcases of most popular content across BBC Online at any time and real-time listings for BBC TV and Radio. At-a-glance aspects – news and sport headlines, weather forecasts with lottery and travel news updates to follow, plus traditional index-based navigation for quick look-up. And so we arrived at a vision for the new BBC Homepage. By showing less of more, we’ve the opportunity to make the page more relevant for a broader audience. In doing this we enable the sort of ‘serendipitous’ discovery that Director of Future Media Ralph Rivera has talked about – if someone comes to the BBC to be informed, why shouldn’t they encounter content that will educate and entertain them also? Enabling these connections will become an increasingly important part of our public-service mission in a digital age and the new BBC Homepage is proof of our commitment in this respect. According to the Financial Times, beta testing for the new site will run for around two months before the old site is switched off. The Guardian – BBC Website Review: Site Failing to Act as ‘Trusted Guide’. The Financial Times – The BBC reboots its homepage.